About a year ago, my co-workers commented on a particularly stunning outfit I happened to be wearing. We have no dress code at my office. We are exceptionally casual. So my stunning outfit consisted of jeans, black top with empire waist, floral sweater in black, gray and white. Of this group of co-worker friends, I am the oldest. I could almost say, “I am the oldest by far” – but let’s not go that far. I was happy to receive these sincere compliments on my attire – (I am delirious, actually, when anyone says I look good – why just today a friend said I had a lovely complexion, and I needed to work that into this post, so here it is.) – and I found it an opportune time to discuss my future fashion choices. I am obsessed slightly worried that I will start to look foolish if I don’t sometime soon “dress my age”. I don’t want to be an old lady dressing like a teenager. We’ve all seen some of those. So my friends and I made a pact. They formulated a secret code to let me know if I cross the line from stylish to ridiculous. We had a good laugh over it that morning. But Yikes. Here it is a year down the line, and I heard the secret code. I went to work the other day in one of my favorite outfits. I’ve worn it before. It’s cool. I love it. 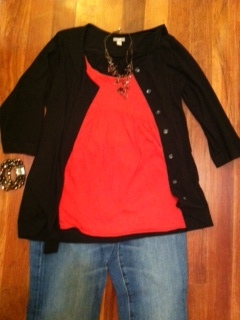 Red empire waist tunic, black knit jacket, superb jeans. She wasn’t part of the pact. She doesn’t know the secret code. TOTALLY non-applicable! I know how you feel, though. I try to go clothes shopping and I feel like (in the words of Evelyn Couch in “Fried Green Tomatoes”) I’m “too young to be old and too old to be young.” And I “love” (which means hate) the way clothing companies play around with sizes — massaging them so women can feel thinner. I have outfits in my closet ranging from size 4 to size 10…and they all fit exactly the same way. Go figure. How I love “Fried Green Tomatoes” – the book and the movie both! I never could make up my mind, though, whether I was Evelyn, Idgie, or Ruth. I agree – that comment doesn’t count. Cute outfits, completely appropriate no matter your age. For the record, Donatella Versace is pretty scary looking, no matter what she’s wearing! As long as you’re not wearing sweatpants with the words “juicy” sewn into the bottom, you’re golden. . . .and this is because no one should ever wear these. Not applicable – she didn’t know the secret code. Who knows? Maybe her daughter dresses like a stylish middle-aged woman.Take the compliment and run with it! So non-applicable! From what I see, your fashion sense leans towards the classical. It’s not like you’re wearing a sweatshirt, tutu and combat boots. Keep on with what you’re doing and that is looking fabulous! I only wear a the sweatshirt, tutu and combat boots on Fridays. This sounds perfect. I am especially hopeful that no one would remember it, and therefore I will never have to hear it. Nancy, you always make me laugh, and remember that age is a state of mind. BTW, since you are 3 months older than me, can I have that black jacket? Another vote for “does not apply” Those appear to be completely appropriate and stylish choices. I used to worry that I was dressing like my daughter but she never wants to borrow any clothing from me so I am thinking I am okay?! Interestingly, I am working on a wardrobe post for next week. I hope you will stop by. Congrats on another brilliant post! You’re right… I have an adult niece, and she would never wear my stuff…. I think….. although she did ask once if I had any old hippie clothes that she could borrow for Halloween. Doesn’t count!!! But – I know exactly what you mean about wanting to dress ‘my age’..altho I’m still feeling like I’m my daughter’s. Wonderful post!!! I say that if she wasn’t part of the pact that her opinion counts for ‘diddley-squat’! I think both outfits you pictured in your post today are awesome, and suitable for a woman of any age–I know that our generation will still be wearing jeans and ‘cool’ tops when we’re in our eighties…that’s just what we’re comfortable in, it seems. You remain hilarious, and might I say I bet those clothes look a far sight better on you than they do on the floor. Have a great day! Nancy, the outfit is very nice. Those clothes are ageless. I shudder when I remember what “older” ladies used to wear. Thank God for jeans!!! Those look like pretty ordinairy clothes to me. It’s not a mini skirt of short shorts for heaven’s sake! Maybe she meant, in part, that her daughter loves those colors. Thanks. I’ll check out your blog. Ha ha, the other ‘secret code’ is when your 85 year old mum says she likes your hair/what you are wearing/etc….definite no-no!!! Oh no! My 87-year-old mother says that all the time! I say there are more of us “boomers” than anyone else and what we say or wear rules! It features women who aren’t afraid to redefine the word ‘fashion’! I read advancedstyle.blogspot.com once in a while myself. Those ladies are a fabulous riot. I am hoping to be exactly like that when I am eighty. Definitely non-applicable. I love your pact, though! While I tend to side with women who say we shouldn’t worry about silly “rules” for dressing as we age, I think we all know that it IS possible to go too far and dress in a way that has diminishing returns. It’s just for all of us to figure out what that means, exactly, for ourselves. Inspiring me to laugh…really laugh…is hard to do. This bog did! Well done! It totally doesn’t apply! I know these things. You can trust me. I really love those jeans, by the way. Keep the outfit. But this is something I think about all the time!! And it isn’t just clothes – how do you know when you need to change the hair? We have all seen the woman who we just think “cut the hair”. I told my stylist – please don’t let me wear a 20 something year olds’ hair style. But I constantly think about the clothing too. My mom is turning 87 – she still rocks great clothes! I do agree that there comes a time—not yet—that one does have to step back and take a look to see if updating of any kind needs to be addressed. However, petite women can get away with dressing how they like much longer. Drat!